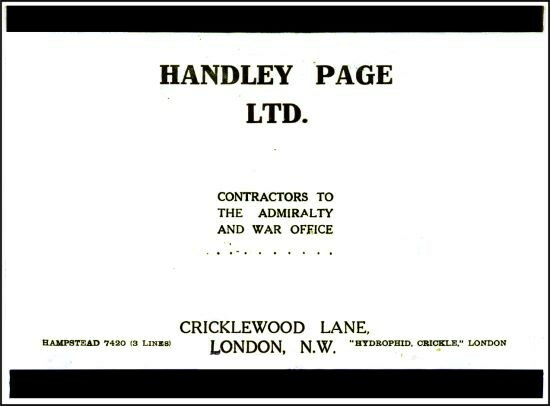 Handley Page, aircraft manufacturers of Cricklewood, later Radlett. 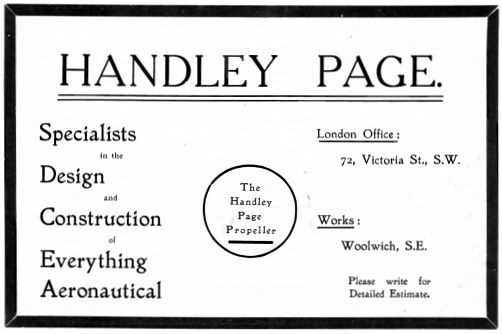 1909 Frederick Handley Page first experimented with and built several biplanes and monoplanes at premises in Woolwich, Fambridge and Barking Creek. 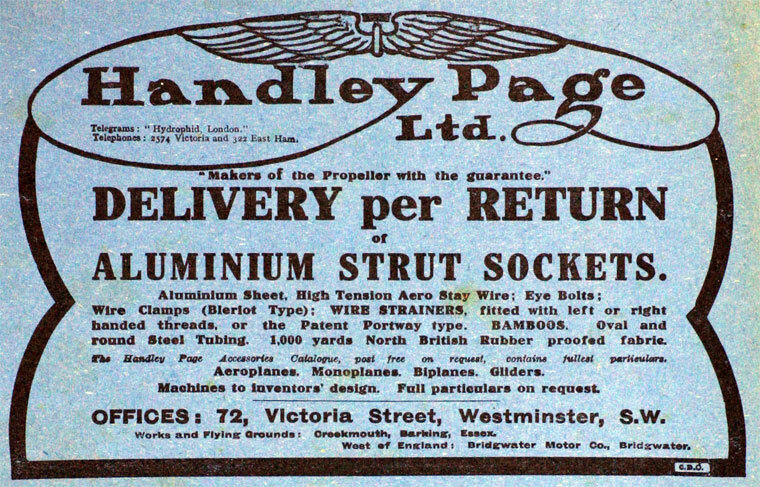 His company, founded on 17 June 1909, became the first British public company to build aircraft. 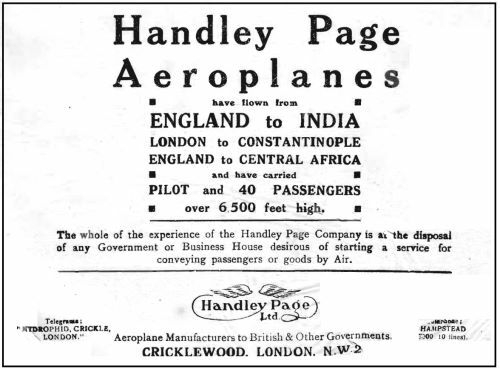 1912 Handley Page established an aircraft factory at Cricklewood after moving from Barking. Aircraft were built there and flown from the company's adjacent air field. WW1 During the First World War Handley Page produced a series of heavy bombers for the Royal Navy to bomb the German Zeppelin yards, with the ultimate intent of bombing Berlin in revenge for the Zeppelin attacks on London. The aircraft included the O/100 of 1915, the O/400 of 1918 and the four engined V/1500 with the range to reach Berlin. The V/1500 only just reached operational service as the war ended in 1918. 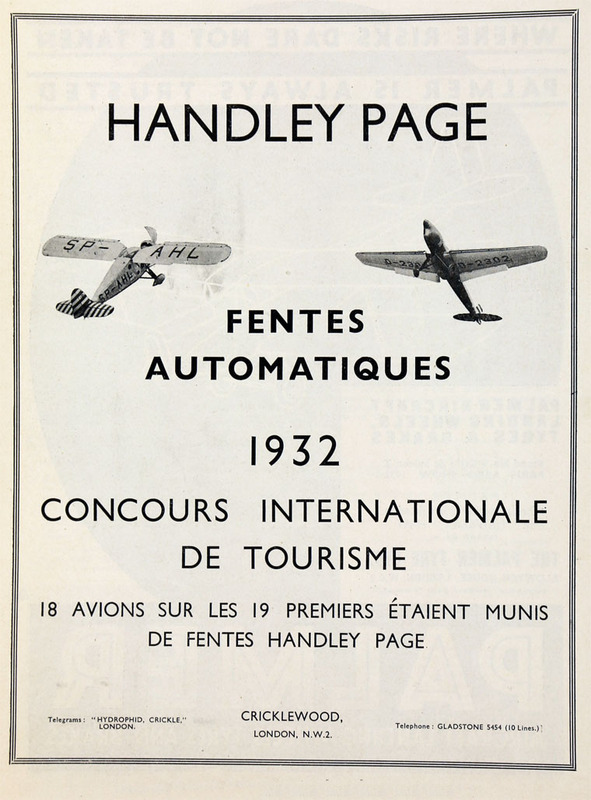 In the immediate post-war years, Handley Page modified a number of O/400s to passenger use, which they flew on the London-Paris route as Handley Page Transport. The V/1500 was considered too large to be practical at the time, but a number of design features of the V/1500 were later incorporated into a O/400 airframe to produce their first dedicated passenger design, the W.8. 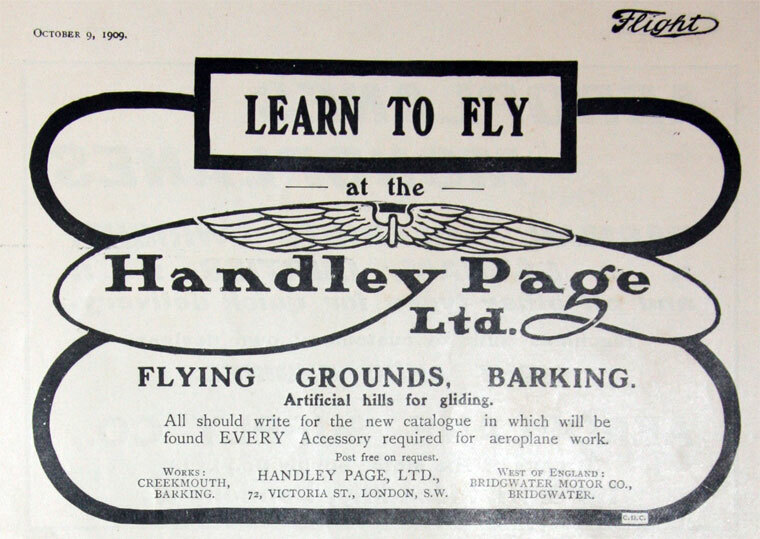 1919 Handley Page paid for the development of what soon became known as the Handley Page Slat, a small channel cut into the leading edge of the wing to improve airflow at high angles of attack, which was patented in 1919. The design was so successful that licensing fees to other companies was their main source of income in the late 1920s and 1930s. When the patent expired in 1938 the company had earned £750,000 from worldwide sales. 1924 Handley Page Transport merged with two other regional airlines to create Imperial Airways, the UK's first national airline service. 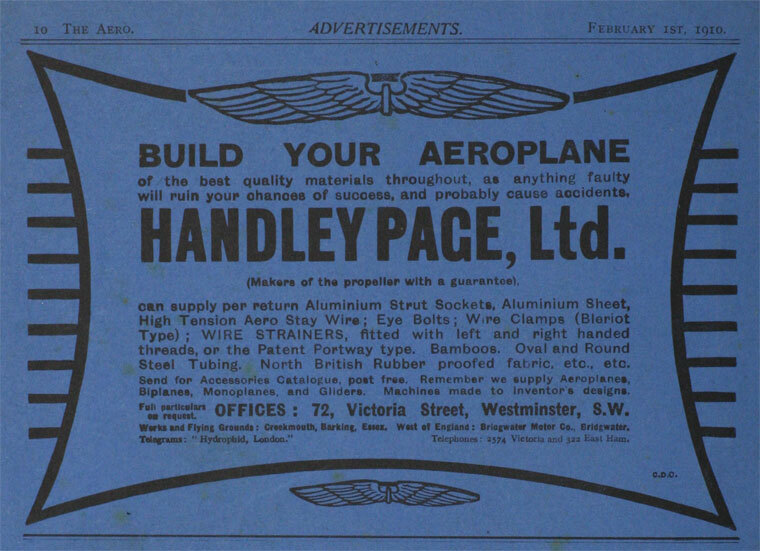 Handley Page developed several large biplane airliners, including the 12 luxurious Handley Page H.P.42, for use on Imperial routes to Africa and India. 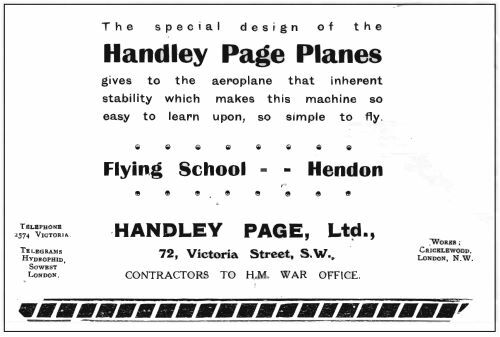 From 1924 until rearmament began in 1936 Handley Page Ltd was not very profitable. 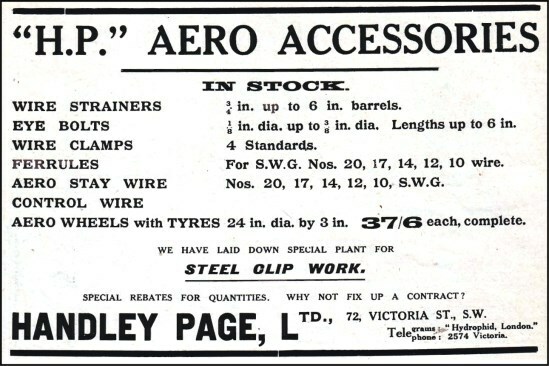 Graceful airliners were produced for Imperial Airways, but orders were too few to guarantee large profits. 1929 the airfield at Cricklewood was closed and a new one built at Radlett, where most aircraft were now to be constructed. 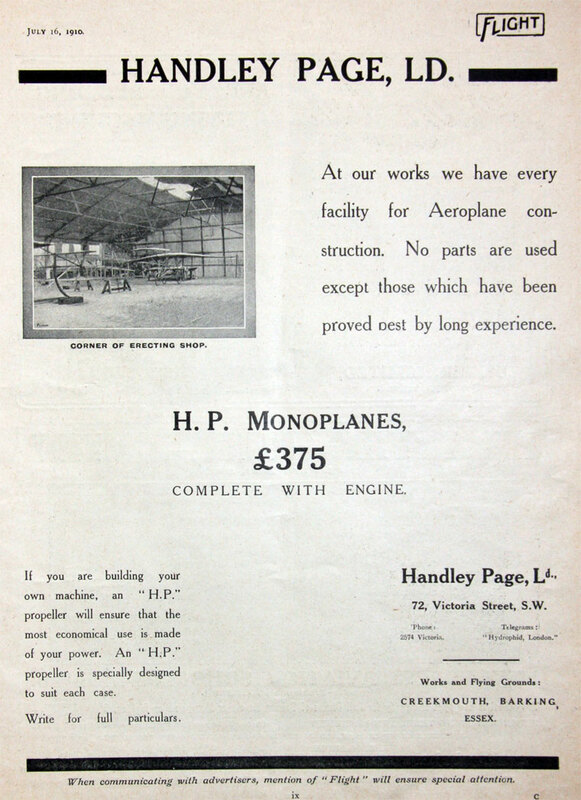 However the construction of aircraft at Cricklewood continued until 1964 when the premises were sold to become the Cricklewood trading estate. 1933 Designers and constructors of military and civil types of aircraft. 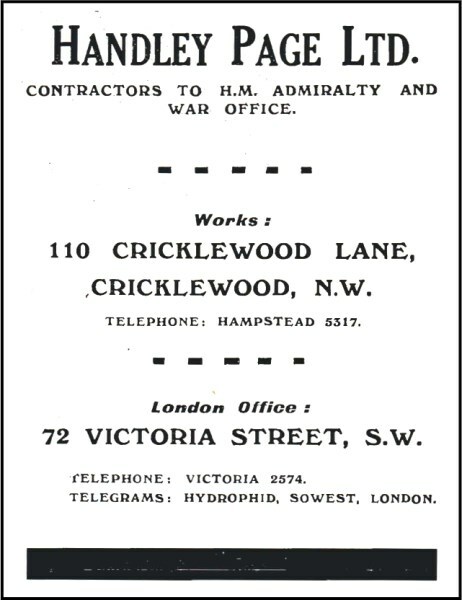 Head Office and Works: Cricklewood, London N.W.2. ; branch at Radlett Aerodrome, Colney Street, near Radlett, Hertfordshire. 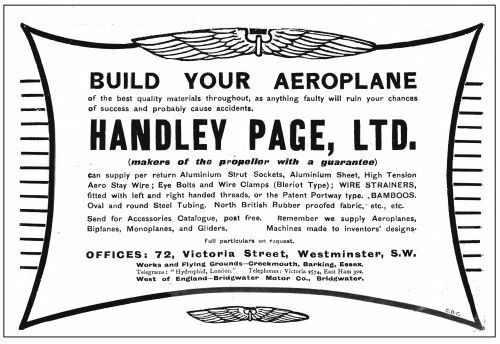 1947 Handley Page bought the aircraft-related assets of the bankrupt Miles Aircraft company. These assets include existing designs, tools and jigs, and the Reading site at Woodley. The most significant of the inherited designs was the Herald airliner. 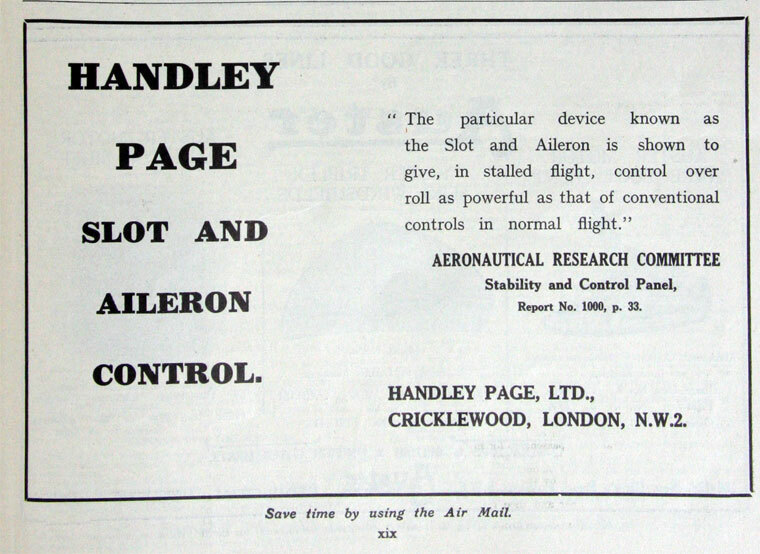 Designs coming out of the Reading site were shown by the initials HPR ("Handley Page, Reading"). Handley Page produced the Miles-designed M.60 Marathon as the H.P.R.1 Marathon. 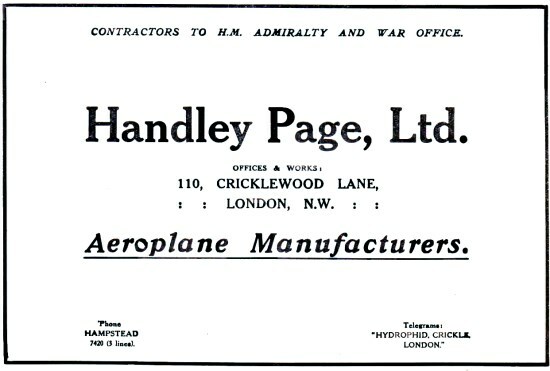 Unlike the other large British aircraft manufacturers, Handley Page resisted the Government's pressure to merge into larger entities. By the late 1960s, the British aviation industry was dominated by just two combines - Hawker Siddeley and the British Aircraft Corporation. Unable to compete for Government orders or with large commercial aircraft, Handley Page produced its final notable Handley Page design - the Jetstream. This was a small turboprop-powered commuter aircraft, with a pressurised cabin and a passenger capacity of 12 to 18. It was designed primarily for the United States "feederliner" market. 1970 The Jetstream was too late to save Handley Page, and the company declared bankruptcy in 1970 and was wound up after 61 years trading under the same name. The Jetstream however lived on as a successful product, the design being purchased and produced by Scottish Aviation at Prestwick and later when Scottish Aviation was incorporated into British Aerospace from 1977. This page was last edited on 15 September 2017, at 10:06.